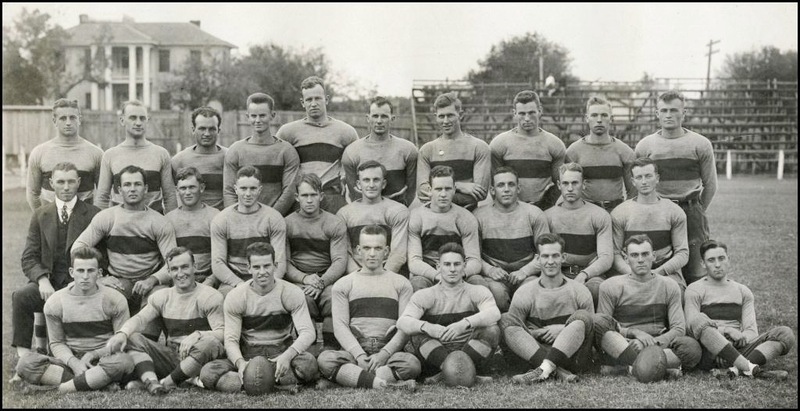 Above: The 1915 University of Texas football team poses at the north end of old Clark Field. The house behind them is now the site of the Patterson Labs Building. October is here, and the fall semester is hitting its full stride. Mid-terms, papers, and lab reports. Concerts, plays, and intramural sports. The campus is bustling and humming well into the night. For the Longhorn nation, fall brings with it the familiar sights and sounds of the stadium, from the “Hook ’em Horns” hand sign to the singing of the “Texas Fight!” song. There was a time, though, when hand signals and fight songs didn’t yet exist, when Alpha Phi Omega’s giant Texas flag or the Texas Cowboys’ “Smokey the Cannon” weren’t yet a part of Longhorn football games. 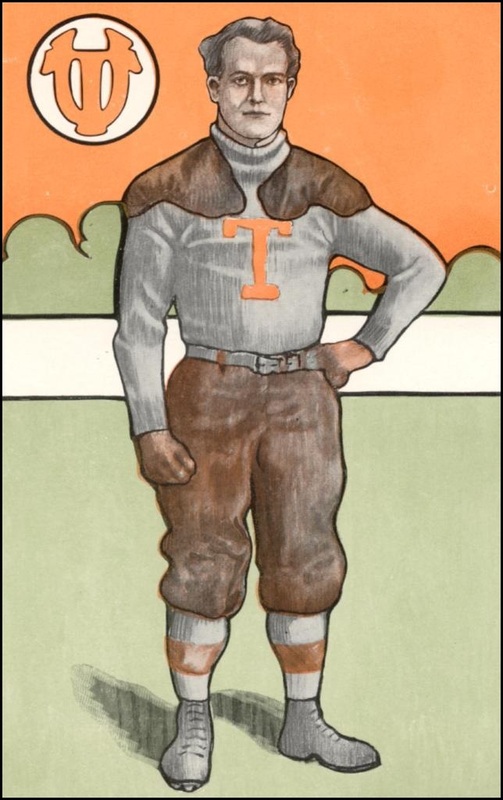 What were some of the University of Texas football traditions a century ago? 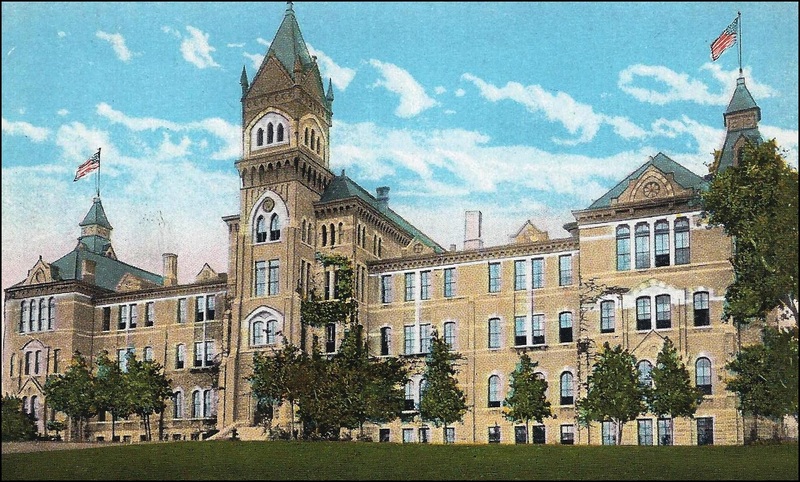 Above: The old Main Building, where the UT Tower is today. A north wing in back housed a 1,700 seat auditorium, regularly used for campus football rallies. 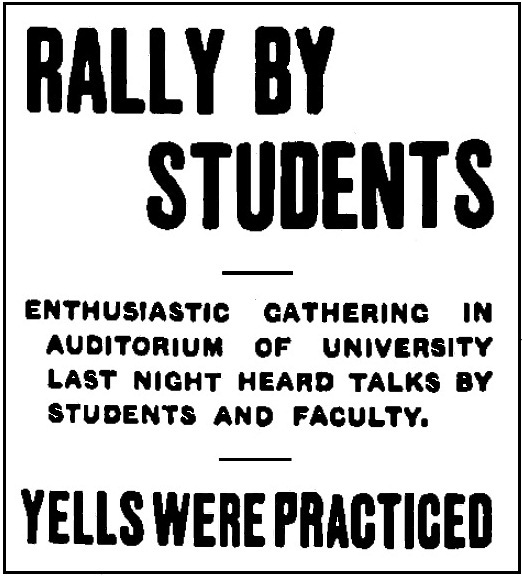 Football rallies were regularly held on the Friday evenings before games in the auditorium of the old Main Building. Following the social mores of the time, only the men were allowed to yell, and found seats on the main floor. It was considered “un-ladylike” for co-eds to get too rowdy; they watched from the second-floor balcony. 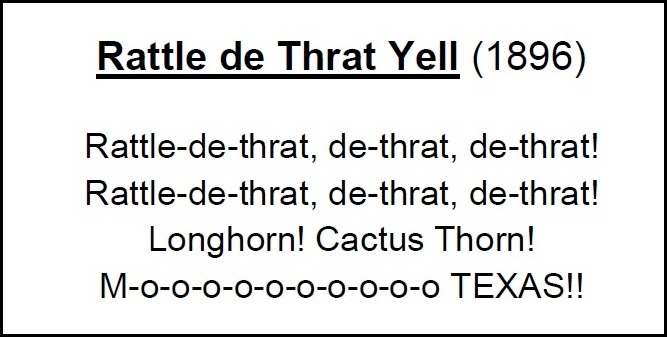 Listen to some of the old UT cheers recorded at the 2007 Big Yell. To make sure everyone knew the words, pocket-size yell books were printed and distributed, especially to new students, at the start of the fall term. Because much of the original Forty Acres was on a hillside, space was limited for outdoor sports. In the 1880s, baseball games were played on the relatively flat northwest corner, where the Texas Union stands today, and students waiting to bat rested under the trees now called the Battle Oaks. By the 1890s, students were using a 3 ½ acre vacant lot just east of campus along 24th Street, but in 1899, the owner, a Mr. de Cordova, asked that the University either purchase the field or it would be divided and sold for private residences. A $3,000 price was negotiated. Students collected $1,300 among themselves, faculty donated $1,000, and the alumni contributed the rest. 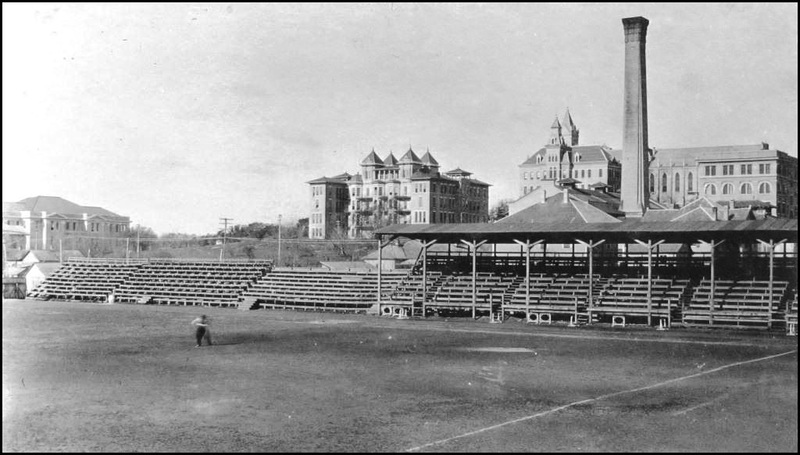 Intercollegiate football and baseball games were played there, along with informal intramural contests. In 1906, at the students’ request, the Athletics Council formally named the field after the beloved James Clark (photo at right), who initially served as the University’s proctor, librarian, registrar, bursar, academic counselor, and groundskeeper, all at once. 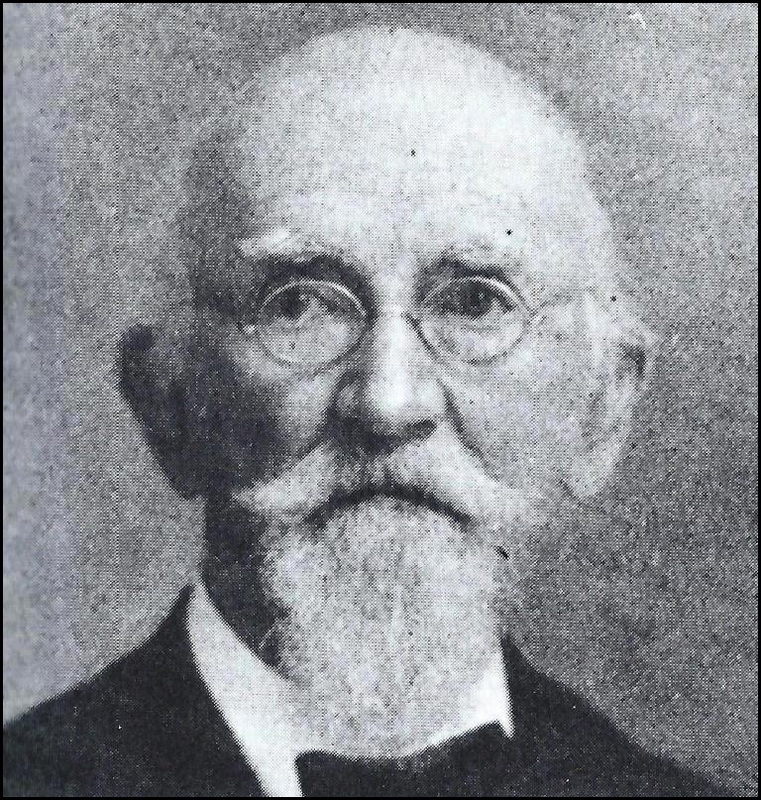 A friend to everyone, Clark was known to bring soup to students who were ill at home, and personally funded an annual Christmas banquet for those who were stuck in Austin for the holidays. A Clark Field still exists on the campus, just south of the San Jacinto Residence Hall. The following year, 1907, students raised funds and constructed wooden bleachers in time for the annual football game with Texas A&M (see The One Week Stadium), then continued to add seats, roofing, and a press box over the next decade. By the late 1910s, Clark Field could accommodate about 20,000 fans, the largest in the South. Above: A view of Clark Field from the east stands, with the Forty Acres across Speedway Street and up on the hill. Buildings from left: Law Building, B. Hall (men’s dorm), Old Main, the smokestack of the old power station, and the Engineering Building on the right (today’s Gebauer Building). 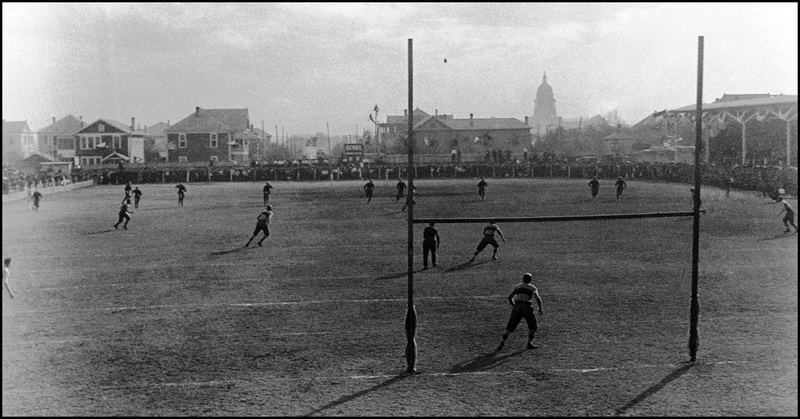 Above: A sunny kick-off for the Texas vs. Rice University game in 1916. Looking south across Clark Field, with the Texas Capitol in the distance. 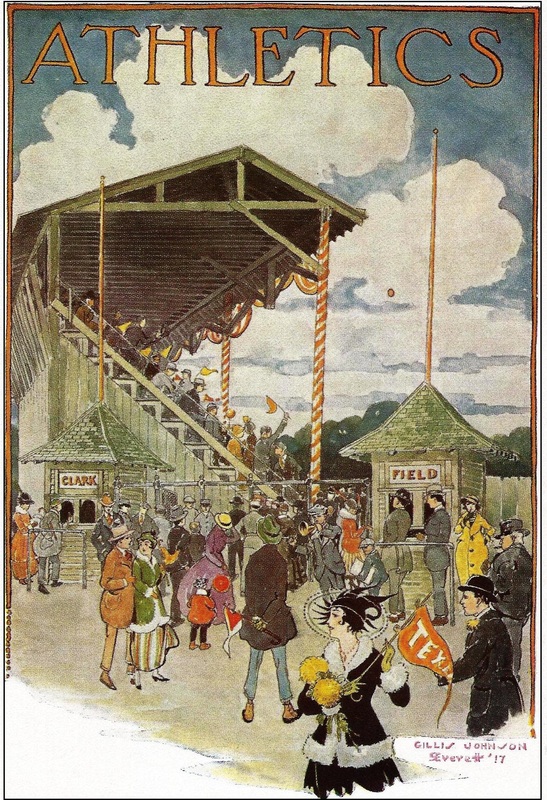 “A custom which is never forgotten is cheering in the bleachers,” wrote UT student Rupert Robertson, who was a UT track letterman in the 1910s. “When the teams trot out upon the field, the rooters give ‘Rattle-de-Thrat,’ and as soon as the game begins, they sing ‘The Eyes of Texas are Upon You.’ So much noise is going on all through the game, you can hardly hear your ears.” As with the football rallies, yelling was generally limited to the men until the mid-1920s. Women were permitted to applaud, sing, and wave Texas pennants, but anything too raucous would bring a stern warning from the Dean of Women. Before the addition of a public address system, UT yell leaders, dressed in white to be easily seen, coordinated the cheering through hand signals that had been explained and rehearsed at the Friday evening football rally. 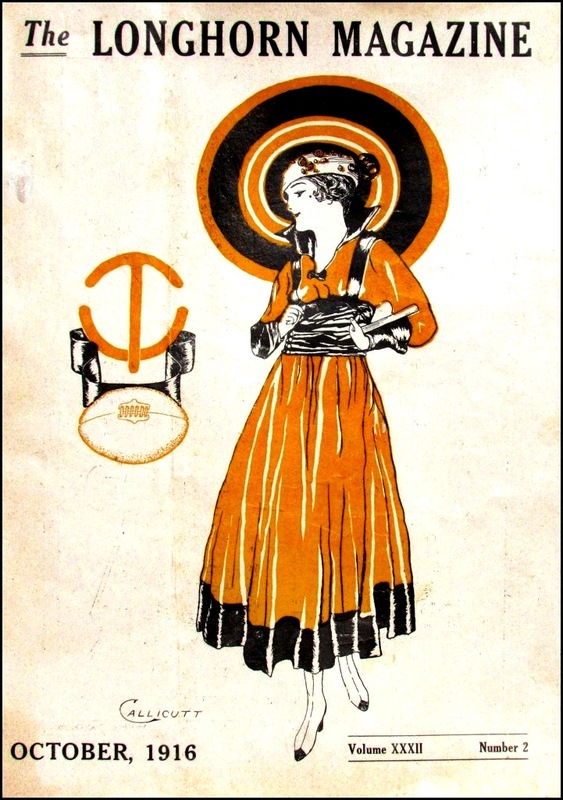 Above right: The October 1916 cover of the student-published Longhorn Magazine displayed the latest in co-ed football fashion. 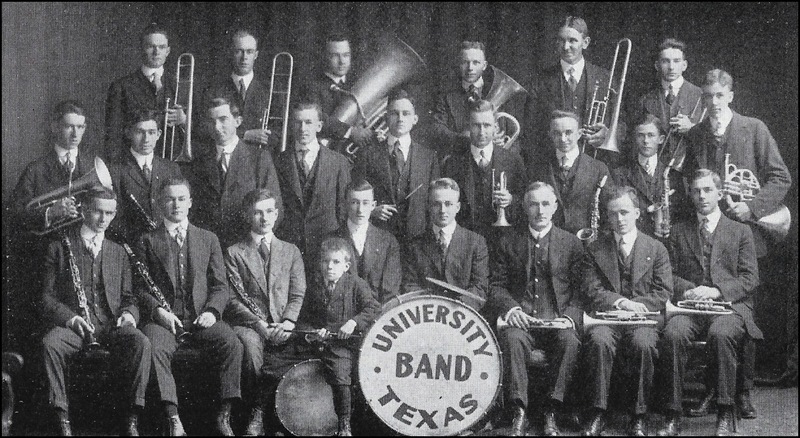 Above: The 1916 version of the University of Texas Band (with a junior mascot). While today’s halftime tradition is to enjoy a performance by the Longhorn Band, the custom a century ago was the reverse. The band, usually under thirty-members strong, remained in the stands and provided musical accompaniment as fans left their seats for a “snake dance,” and ran single file in a tortured course up, down, and the length of the field. It was meant to show enthusiasm and support for the team, and was a great source of amusement for the ladies who watched from their seats. Above: A 1923 version of the halftime snake dance. Modern halftime performances of the Longhorn Band began soon after the opening of Texas Memorial Stadium in 1924. 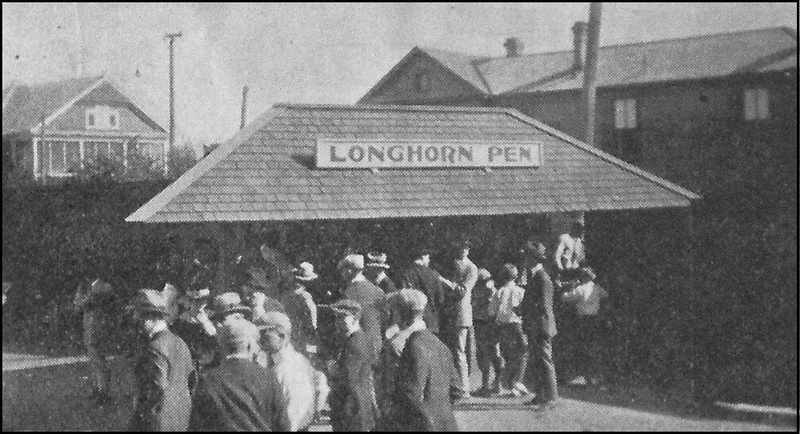 Above: The Longhorn Pen was located just inside the Speedway entry to Clark Field. 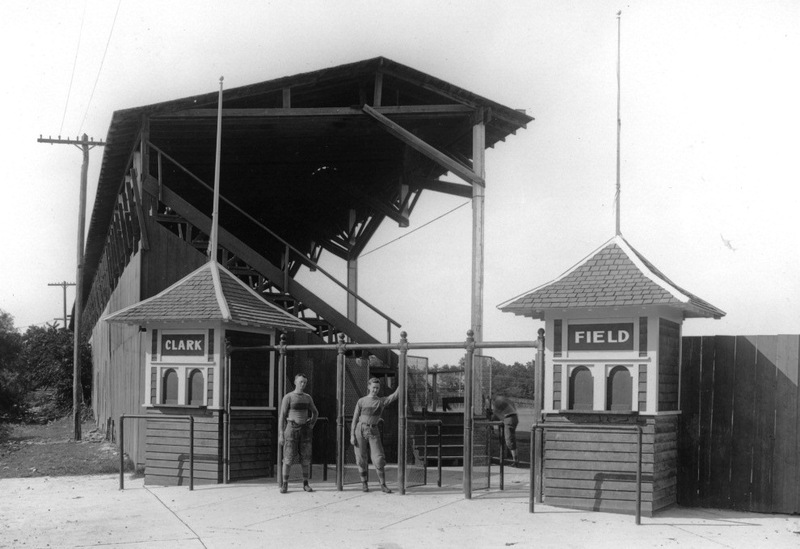 Above: The main gate to Clark Field, near the corner of Speedway and 23rd Streets.